Well-known Poker player Gordon Vayo has avoided paying a huge $280,000 fine in a case which saw his Poker VPN use brought to light. In 2017 Vayo took part in a PokerStars tournament called the Spring Championship of Online Poker or SCOOP. A tournament he went on to win and with that came a prize of nearly $700,000 or just over half a million pounds at today’s rate. Soon after Vayo found his winnings frozen for “suspicious activity”. What transpired was that PokerStars did not believe Vayo’s claimed location. He said he was in Canada at the time where online gambling is legal, although PokerStars had other thoughts and accused him of using a VPN app to disguise his real location in the United States. As you would imagine $700k is a huge sum of money and not one Vayo was going to let slip so easily. He filed a court case against PokerStars in California in the aim to claim his winnings. As part of his evidence, he submitted documents to show he was in Canada at the time and claimed he was only using a VPN to watch some kind of geo-blocked TV show. Evidence came in the form of ATM receipts and other utility bills. Where the story gets interesting is it’s claimed that PokerStars received a tip-off and were able to contact a third party who forged the documents on Vayo’s behalf. Once faced with the information, Vayo quickly dropped his court case. But the story doesn’t end there. PokerStars then went on to file its own case against Vayo to recover the legal fees incurred in defending themselves in the first case. Armed with the evidence of Vayo using forged documents it was a case they would surely win. On December 4th, 2018 though PokerStars decided to drop the court case against VPN-using Vayo leaving him without a $280k bill hanging over his head. While $280k is a sizeable amount to any normal person it is relative pocket change to PokerStars and Vayo himself who has earned over $6 million dollars in his Poker career. However, it might not stop there for Vayo though as the use of forged documents in opening a bogus court case could lead to further punishments should authorities decide to pursue him. While no court case has proven either way the fact Vayo supplied forged documents to try and prove his claimed location suggests he most likely did use a VPN to play on the PokerStars website from the US. Although he’s forfeited his near $700,000 winnings he hasn’t actually defrauded PokerStars of any money. He played the game fair and square and beat his opponents. His only crime was being in a jurisdiction where playing PokerStars was disallowed. Had he been 1,500 miles to the north in Canada his bank balance would be $700k healthier. Being one of the largest online Poker sites in the world it’s important PokerStars are seen to be proactive against users trying to circumvent geo-restrictions. Not doing so could cause them to lose their license or face criminal charges in the US at least. 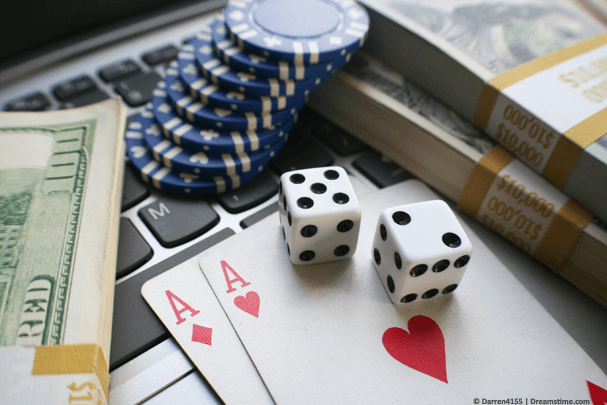 Online Poker and gambling are heavily regulated in the United States and only in recent years have restrictions in some states been relaxed. Vayo isn’t alone in his VPN use. In 2016 pro-Poker player, Sorel Mizzi was banned from using PokerStars for 2-years after it was also claimed he used VPN services to play on the site while in the United States. VPN apps can bypass many types of geo-restrictions from allowing you to watching BBC iPlayer outside the UK to those on online gambling sites. However, just because they can, doesn’t mean you should use them as such. While you may get away with the odd $10 or $20 wins while using a VPN, if you’re a gambler of Vayo’s calibre then you may want to hop on the quickest flight north next time you’re planning on playing a big stakes tournament.